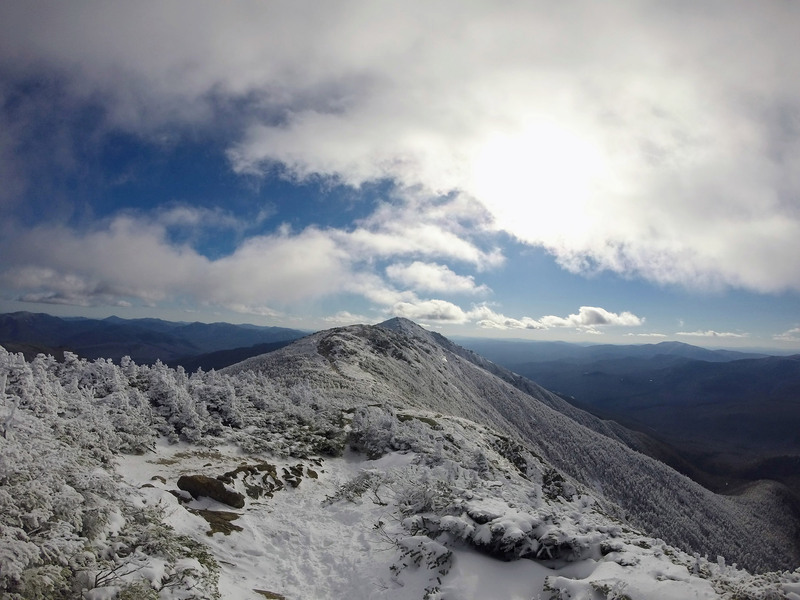 Take on one of the Northeast’s most stunning ridgelines while tagging two of New Hampshire’s 10 tallest mountains. 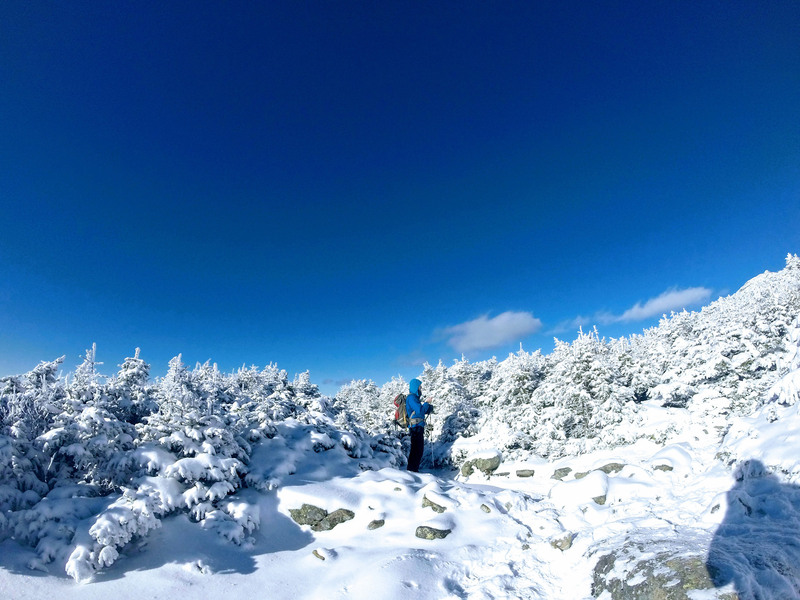 A true classic, this winter hike crosses one of the White Mountains’ most prominent features, Franconia Ridge; delivers moderate climbing that doesn’t require the use of an ice axe; and features a roughly 1.5-mile above-treeline ridge run between Little Haystack and Mount Lafayette. 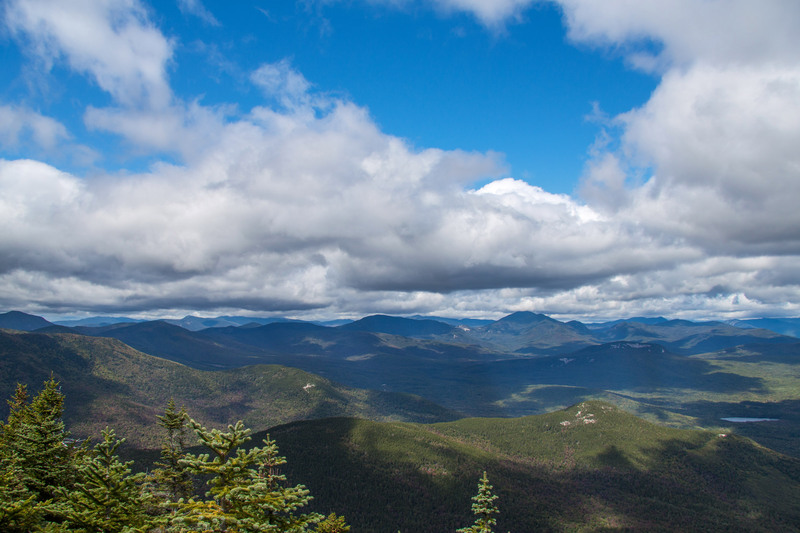 With 360-degree views of the Whites from the ridge, it is one of the Northeast’s most beautiful hikes. And, with a large section of above-treeline hiking, it’s also one of the region’s most exposed hikes, making it a fantastic winter test piece. Most hike Franconia Ridge as a loop, beginning and ending at the Falling Waters and Old Bridle Path trailhead and parking lot on Interstate 93N (44.142048, -71.681206) in Franconia Notch State Park. Hikers driving north on I-93 will find the parking lot just after the exit for The Basin trailhead. Hikers coming from the other direction should park in the Lafayette Place Campground parking lot and use the tunnel that goes under I-93 to access the lot and trailhead. The trailhead is opposite the entrance to the parking lot, where it climbs a short, paved incline to an outhouse and then becomes dirt as it heads into the woods. Hikers, take notice: This ultra-classic hike is super-popular on weekends and holidays. So, get there early to find a parking spot. 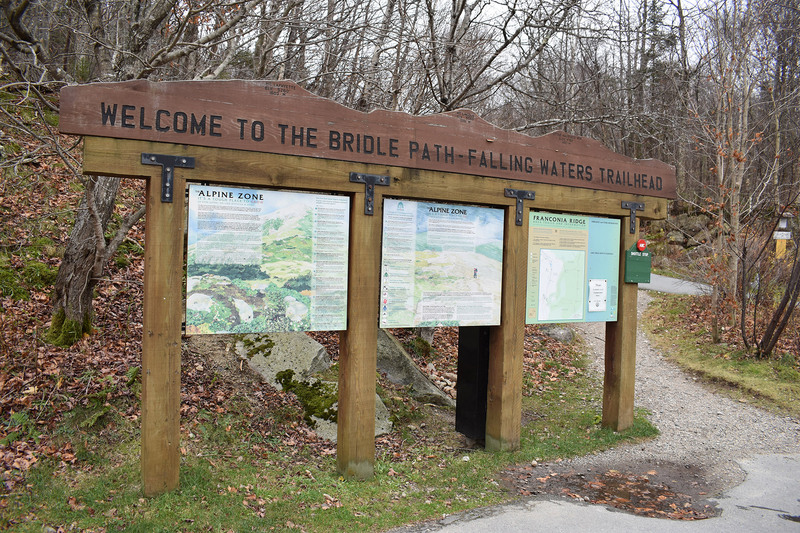 Just 0.2 miles in, hikers will come to the junction (44.139702, -71.679512) of the Falling Waters Trail and the Old Bridle Path. The loop is best done counterclockwise, first up the Falling Waters Trail and then descending the Old Bridle Path. The Falling Waters Trail, which veers right at the junction, gets extremely icy in winter and is much easier to go up than down. Plus, the various waterfalls are more scenic on the approach, as well as more easily overcome with fresh legs early in the day. From the junction, the Falling Waters Trail heads southeast on a moderate track, until it reaches Dry Brook. From there, the trail intermittently steepens and poses some small technical challenges, as it crisscrosses the icy stream climbing under, around, and over a series of semi-frozen waterfalls. Between the water and ice, the footing along here is often slick, and you’ll probably want your MICROspikes and a pair of trekking poles to negotiate the potentially treacherous terrain. Take care not to slip or plunge a foot into the brook. Eventually, the trail leaves the brook and begins a series of long, gradual switchbacks up toward Shining Rock. As the trail moves away from the brook, the short, steep, and technical sections dissipate, and the terrain and grade become more consistent—especially once the snow on the ground is packed and covering the ordinarily rocky and rooty terrain. 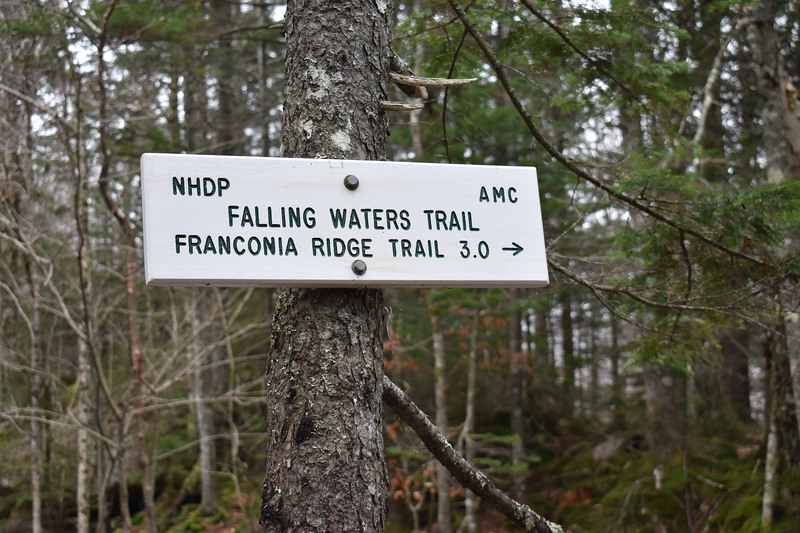 After 2.5 miles, the Falling Waters Trail reaches a junction with a short spur trail (44.140186, -71.650940) that heads downhill to Shining Rock, a large granite slab flanking Little Haystack Mountain and visible from Interstate 93. If you have time (remember, darkness comes early in the winter), consider the brief detour. The Shining Rock junction is also a great place to refuel, add an extra layer and traction devices (if you haven’t already), and get your above-treeline gear ready (such as a balaclava, warmer gloves, goggles, etc.). From the junction, continue upward on the Falling Waters Trail, which steepens and gradually becomes more exposed to the weather for the final 0.5-mile push to the 4,760-foot summit of Little Haystack. Shortly after departing the junction for Shining Rock, hikers will push past the treeline to the rocky and icy landscape of Little Haystack Mountain’s summit (44.140362, -71.646080). 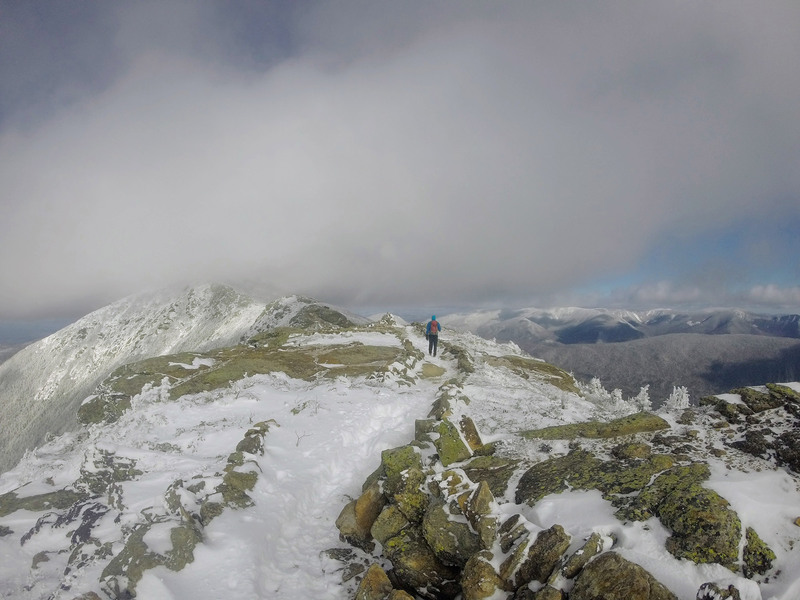 Although Little Haystack isn’t one of the 48 New Hampshire 4,000-footers (it’s technically a subpeak of Mount Lincoln, the next stop on your journey), it is an awesome summit with fantastic views. 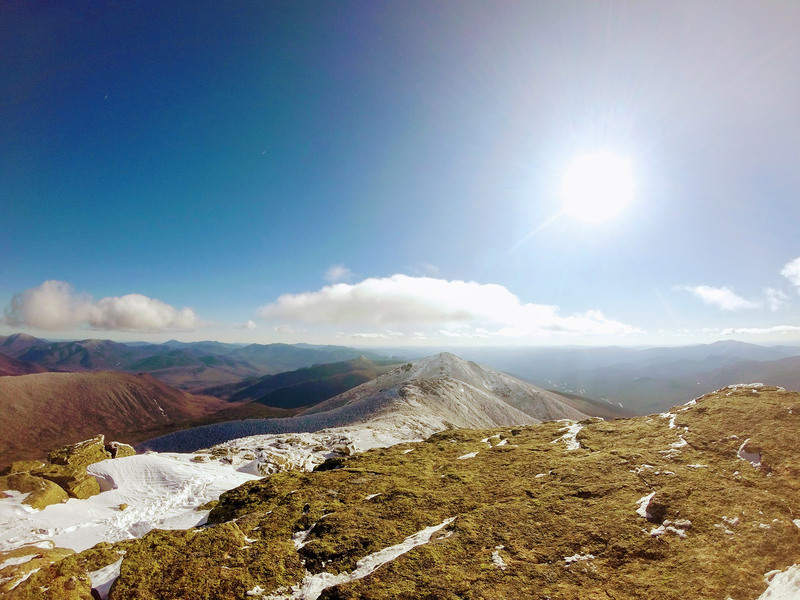 Find the hard-to-miss summit cairn, and then, head north on the Franconia Ridge Trail toward Mount Lincoln. From Little Haystack, it’s 0.7 miles to Mount Lincoln’s summit. The path is easy to follow and, at first, quite moderate. Then, it begins to climb on rockier terrain and crests an ego-deflating false summit, all the while offering fantastic views in every direction and fully exposing you to the wind and weather. 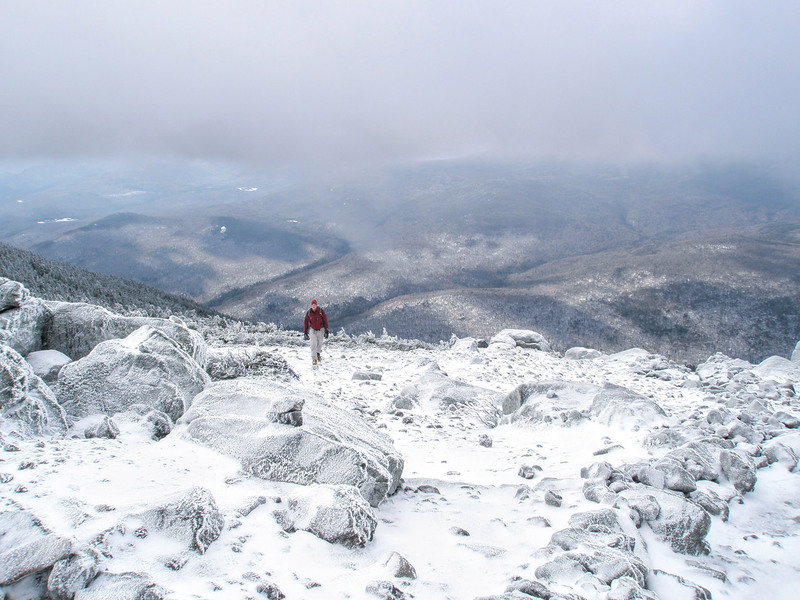 Once you get to the summit of 5,089-foot Mount Lincoln (44.148682, -71.644707), the first of two New Hampshire 4,000-footers on the traverse, take a moment—or more, if the weather allows—to soak in the dramatic landscape and fantastic views. 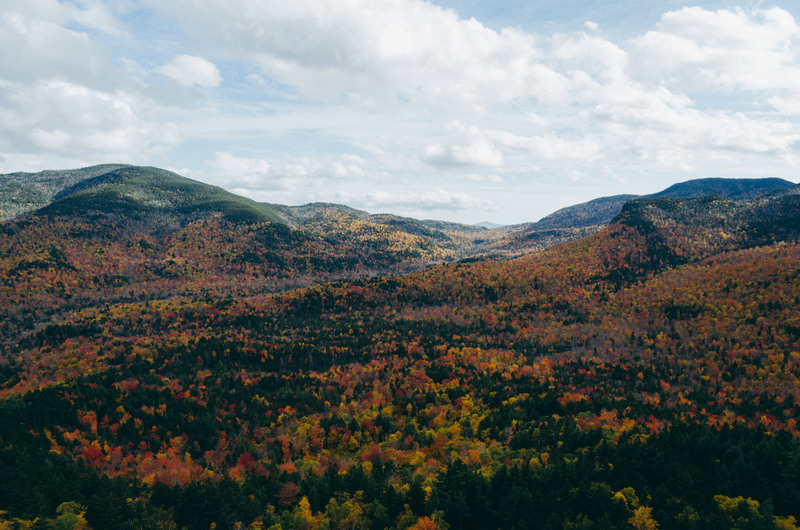 From here, you get views in all directions, with the Kinsmans, Lonesome Lake, and Cannon Cliff to the west and the Pemigewasset Wilderness to the east. To the south, the pyramid-like tops of Mount Liberty and Mount Flume dominate the view, while to the north lies your next objective, the summit of Mount Lafayette. 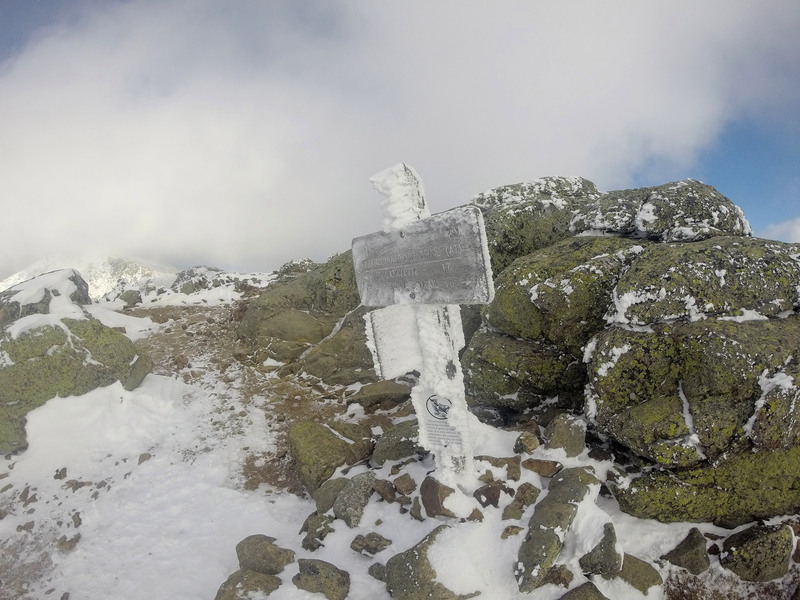 Standing one mile away on the Franconia Ridge is the day’s high point, the 5,260-foot summit of Mount Lafayette. To get there, you’ll give up much of the elevation you’ve gained since Little Haystack by descending rocky, slabby terrain similar to what you just ascended. The saddle has a scrubby pine grove, which provides a brief respite from the weather on less-optimal days. Beware that snow can build up in the trees, making this section more difficult and take longer than you may have expected. 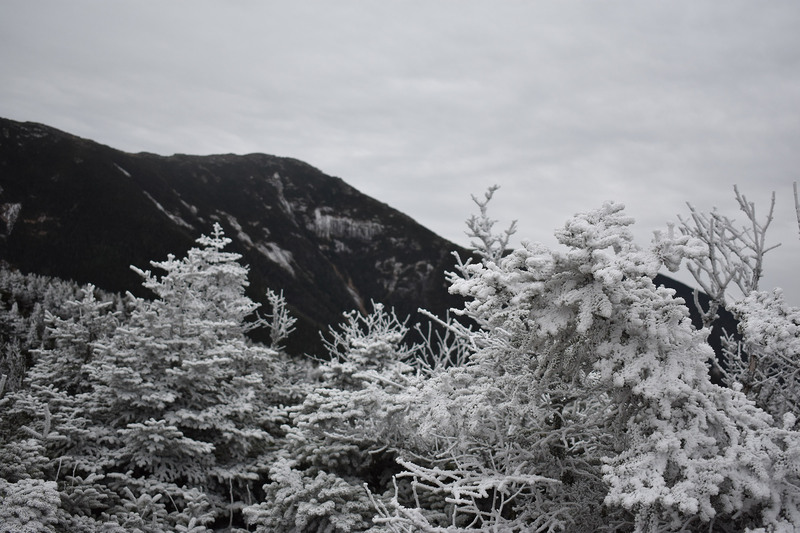 From the trees, the Franconia Ridge Trail makes a sharp ascent—the steepest section since the climb from Shining Rock to Little Haystack—to Mount Lafayette’s summit. Relatively straightforward, the climb does contain a few slabby sections and rock outcroppings that warrant your full attention before you get to the summit. Lafayette’s summit (44.160717, -71.644470) is well marked with both a large cairn and sign, and is quickly recognizable, as it’s the region’s highest point. If the weather is good, grab a seat in one of the summit’s windbreaks—rock walls built to shield hikers from the elements—and soak up the views. The 4,500-foot Mount Garfield looms in the north, and on clear days, the Presidential Range is visible behind it. To the south, you can admire the distance you’ve traveled, as the peaks of Mount Lincoln and Little Haystack are both visible from this vantage point. The windbreaks are also a great place to have a quick snack. And, don’t de-layer just yet, as there is still some exposed trail left on the descent. 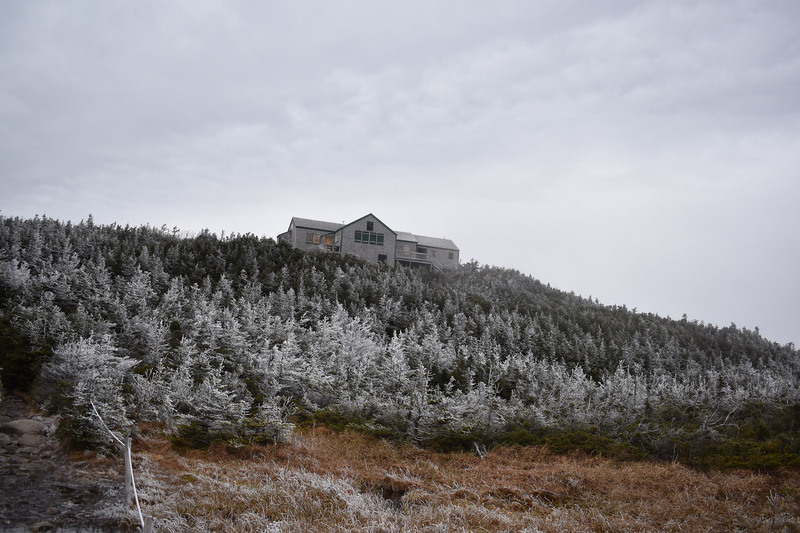 From Lafayette’s summit, take the 1.1-mile Greenleaf Trail toward the Appalachian Mountain Club’s Greenleaf Hut. This section is well defined, but the vast majority of it is above-treeline and is very exposed to the weather—in particular, winds blowing from the northwest. With the hut visible most of the way, progress can feel sluggish. The slow-going is often exaggerated by the trail’s rugged nature, made even more difficult by patches of snow and ice. As you near the Greenleaf Hut, the trail dips into tree cover, the first real break in exposure you’ve had for nearly three miles. You’re not out of the woods yet, though, as the area around the hut is often very icy. Unlike during the summer, there is no hot chocolate, soup, or delicious baked goods in your future—unless you brought your own—as Greenleaf Hut (44.160206, -71.660316) is closed in the winter. However, the building itself provides a good windbreak and is a logical place to stop for a snack and to de-layer. From the hut, take the Old Bridle Path for 2.7 miles to the Falling Waters trail junction, and then, enjoy the short walk back to the car. Below treeline, hikers may feel that the crux of the day is behind them, but the Old Bridle Path’s upper third is challenging and, in places, exposed. Use care negotiating these ledges, slabs, and steep sections. As you descend the ledges, take a moment to peer back up at the ridge. It’s nice to enjoy the relative warmth of the sun found on these protected ledges while you peer up at the ridge and remember the bone-chilling cold experienced only a short time ago. After the ledges, the Old Bridle Path begins to mellow, getting more forested with progressively easier switchbacks. From here, it’s a straightforward, albeit longish, walk back to the junction and then to the car. Trekking poles and traction devices, like Kahtoola MICROspikes, are essential for negotiating the icy terrain on the ascent and descent. And, although the wind often blows the snow off the ridge proper, it, too, can be quite icy. 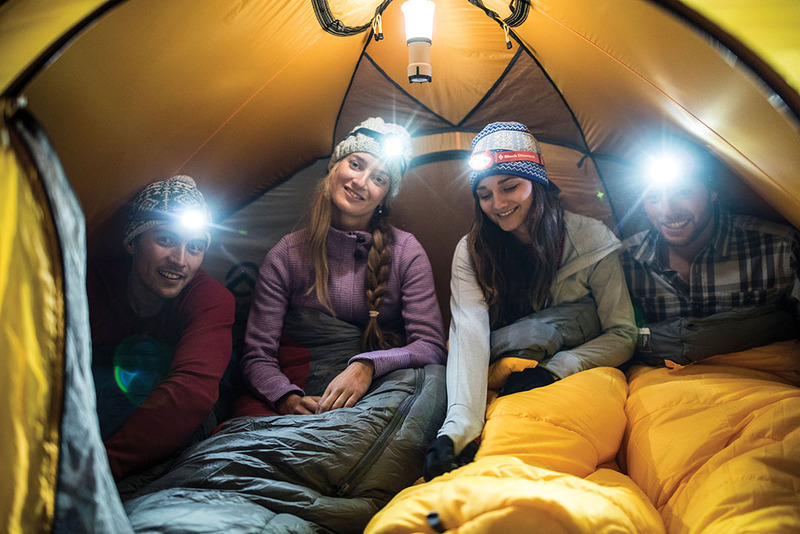 Bring a vast array of winter accessories to contend with unpredictable, above-treeline winter conditions. A winter hat, balaclava, multiclava, and gloves of varying warmth are a good place to start. And, if there’s wind in the forecast, goggles should also be included. A warm down or synthetic parka, like the Outdoor Research Incandescent Hoody, is great for staying warm during rest breaks, cold traverses and descents, and emergencies. Because it gets dark quickly in the winter and the Old Bridle Path descent is treacherous, add a headlamp, like the Black Diamond Spot, to your pack. Snickers bars and gels are great in the summer but can freeze in the frigid temperatures. Nature Valley bars, trail mix, and leftover pizza—just to name a few—are all excellent winter food choices that won’t freeze in your pack. Have more questions about what gear to bring? Check out “What’s in Our Winter Peak-Bagging Packs.” Don’t be that guy in jeans and a hoodie hiking across the ridge. Need a good reason for an alpine start? The parking lots fill up fast! In the summer, excess traffic even goes along the highway, but depending on the amount of snow the mountains have received, that might not be an option in winter. Start cold, so you won’t have to stop after 10 minutes to lose a layer. More importantly, if you’re not over-layered, you’re less likely to sweat through your garments and will stay warmer in the long run. Bring a thermos of something hot to drink. It’s great for warming up your core temperature and a nice morale booster when the going gets cold. Know when to say when. If you get above treeline and decide that it’s too windy or too cold, or you just have a bad feeling, don’t hesitate to turn around before committing to the traverse. Have a backup plan. If you live a few hours from the mountains, like many people do, it can be hard to know exactly what the weather will be doing until you get there. If the weather isn’t cooperating for a traverse, Mount Liberty and Cannon Mountain are close by and are less committing than Franconia Ridge. After a cold day in the mountains, warm up at One Love Brewery in Lincoln, New Hampshire. Their Meat Lover’s Burger features grilled pork belly, BBQ pulled pork, jalapeño slaw, and Swiss cheese, and is a great way to replace some of the calories you burned! 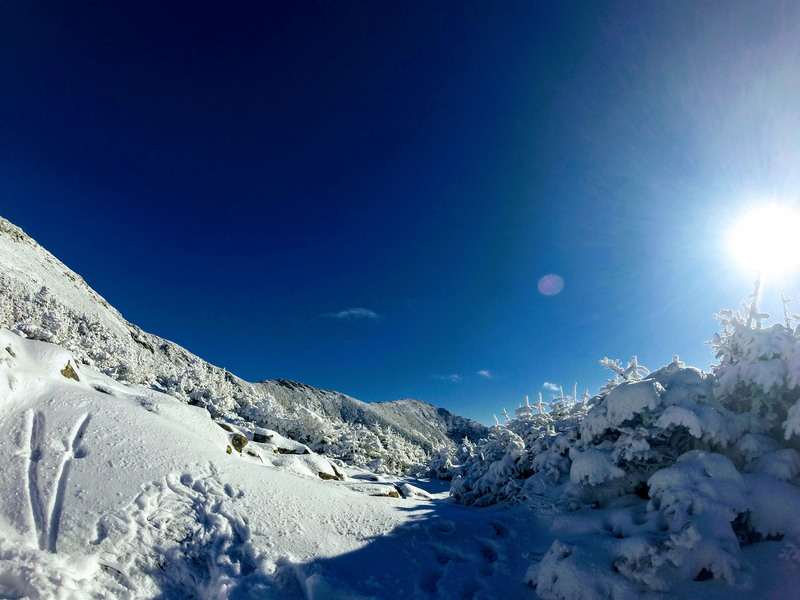 Have you hiked Franconia Ridge recently? Post your experience and the trail conditions (with the date of your hike) in the comments for others! “Do you own a PLB?” my mom asked out of nowhere one afternoon this summer. Embarrassingly, despite spending a decade of my life working in outdoor retail, I had to Google it to know what she was talking about. It’s a personal locator beacon, duh. “Like, for skiing?” I asked, trying to put off telling her that I do not, in fact, have one. Eventually, I learned why she was suddenly so curious. 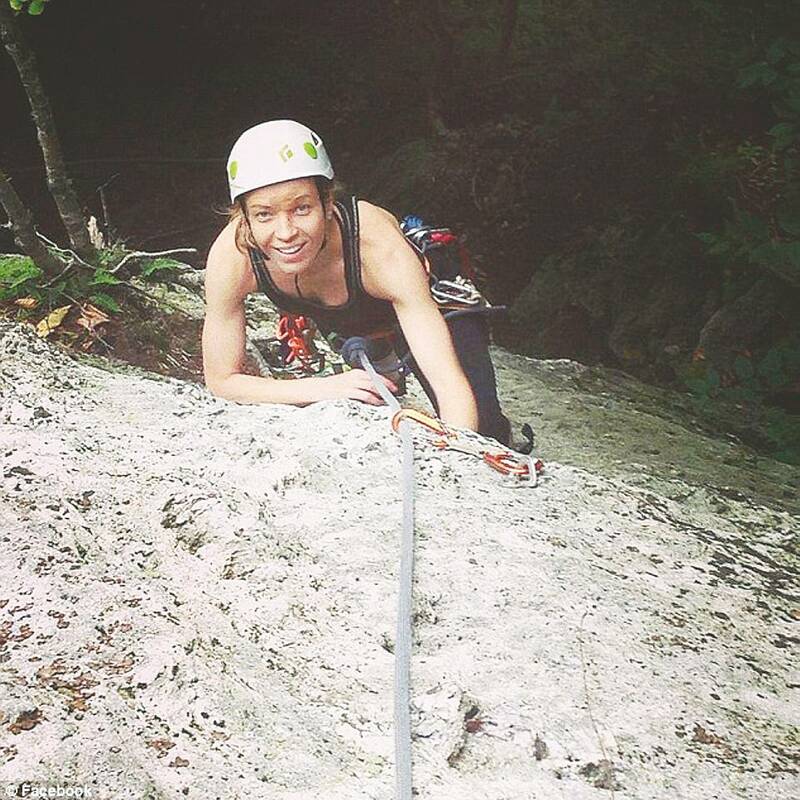 She had attended a presentation given by Ty Gagne, author of Where You’ll Find Me: Risk, Decisions, and the Last Climb of Kate Matrosova, and had convinced herself that I would die on top of a mountain without one. I remembered being equal parts sad and annoyed when the stories about Matrosova and her ill-fated hike of the Presidential Traverse first came to light in February 2015. When Gagne’s book was finally released about two months later, I came home from work to find a copy sitting on my front porch—courtesy of my mom. I held off on reading it for a few weeks, however. I was in the middle of a different book at the time, and I remembered being equal parts sad and annoyed when the stories about Matrosova and her ill-fated hike of the Presidential Traverse first came to light in February 2015. And, I wasn’t in a hurry to revisit those feelings. But, once I started reading it, I couldn’t put it down. Roughly the first half consists of Gagne meticulously piecing together what happened as Matrosova attempted to complete the northern section of the Presidential Traverse (from Madison to Washington) in one day, by herself. Throughout, Gagne tells Matrosova’s story in incredible detail—and without judgment. Data gleaned from her Suunto watch and Garmin GPS, in addition to Gagne’s own exhaustive research, puts her journey together. While he factors in the broader psychology of risk analysis and decision making, he further makes it clear how easy it would be for any confident, hyper-motivated hiker to make the same mistakes. It further reminds you that, no matter how prepared you may be, how much experience you have, or how detailed a game plan you’ve created for yourself, when you head into the mountains, you are at their mercy. The book’s second half reconstructs the search and rescue (SAR) effort. Specifically, this pertains to the timeline from the minute NH Fish and Game received the call about Matrosova activating her PLB to the moment the rescue teams returned to the trailhead with her body. Among my personal knowledge of the area, recognizing some of the rescue crew (shout out to Charlie Townsend, a former EMS Climbing School Guide), and Gagne’s ability to explain the entire SAR process in such great-yet-easy-to-comprehend detail, the story gets especially compelling. As winter approaches and hikers begin to think about their seasonal objectives, reading Where You’ll Find Me should be at the top of your to-do list. Not only is the book a quick and easy read, but it further reminds you that, no matter how prepared you may be, how much experience you have, or how detailed a game plan you’ve created, when you head into the mountains, you are at their mercy. Oh, and if you happen to have a super-motivated but PLB-less hiker in your life, don’t be afraid to “mom” them and give them a copy of Where You’ll Find Me as a hint gift! Fall in the White Mountains sometimes feels ephemeral. One week, you’ll be hiking along in short sleeves, admiring the stunning foliage. The next, you’ll be trudging through the year’s first snowfall, wishing you’d remembered your traction for that icy descent. Luckily, the period from late fall into early winter is the perfect time to explore the region around the Kancamagus. Specifically, the leaf-peeping crowds have dissipated, while the temperatures and conditions remain comparatively pleasant. For those looking to experience the Kank beyond the overlooks, here are three hikes from the highway that offer something for everyone. One of the most popular hikes off the Kancamagus is the 9.8-mile lollipop loop hike of both South and North Hancock. Leaving from Hancock Notch Trailhead, this hike ticks off two New Hampshire 4,000-footers via the Hancock Notch, Cedar Brook, and Hancock Loop Trails. It remains fairly low in elevation, reducing your chances of encountering snow and ice, and stays in the trees for a long portion, keeping you from prolonged exposure to cold wind. And, because this hike gains and loses the majority of its elevation in short, sustained sections, it’s not surprising to find yourself done with the almost-10 miles a little bit faster than anticipated. Deciding which direction to hike the Hancock Loop Trail is the hardest part, however. As a tip, head to South Hancock first. It’s a little bit easier to traverse from the South to the North Peak than vice versa, despite the latter actually being higher than the former. Also, North Hancock tends to have better views. Specifically, a large slab here gives you a chance to enjoy a snack as you look out at the Osceolas and the Sandwich Range. Thus, doing it this way lets you save the best for last. However, summiting South Hancock first also leaves the day’s steepest part for the descent, which can be an adventure in slick or snowy conditions. So, to prepare, don’t forget to bring MICROSpikes and trekking poles. Accessing the Tripyramids from the Pine Bend Brook Trailhead lets you tick off two other 4,000-footers: North Tripyramid and Middle Tripyramid. At about 10 miles round-trip, with almost 3,500 feet in elevation gain, hiking the Tripyramids is much like the Hancocks. Specifically, hikers spend the majority of their time at lower elevations, protected from the elements by the forest. In fact, even their summits are mostly forested, allowing hikers to find shelter from cold weather around the day’s highest points. While the views here aren’t going to make any “best of” lists, you can look out at Waterville Valley from North Tripyramid, while Middle Tripyramid offers a nice sight of its sister to the north and Passaconaway and Whiteface to the west. Hikers approaching from the Kancamagus should be prepared for steep terrain. And, even in dry conditions, the section of trail connecting the two summits can be challenging. It’s also worth mentioning that, despite the trek being below treeline, temperatures and conditions change from the parking lot to the summit, so pack accordingly. Because of the lower elevation, Hedgehog is perfect for those late fall days when snow and ice are starting to accumulate on the higher summits, but you’re not quite ready for hiking in full-on winter conditions. 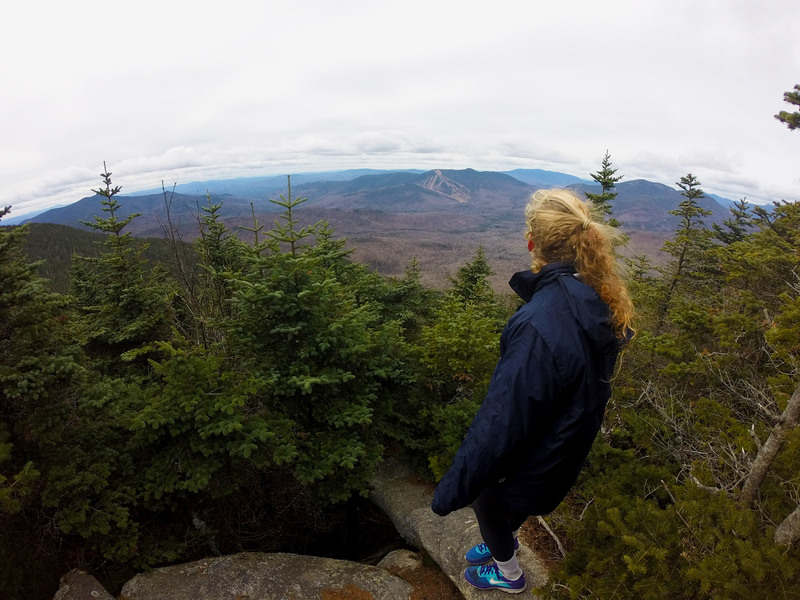 Those tackling Hedgehog are treated to an almost five-mile loop trip that delivers moderate grades, open slabs, and great views of the Presidential Range and Mount Chocorua. Much like when you hike the Hancocks, the hardest decision of the day—other than how long to lounge on the ledges—is which direction to go. We’ve always liked to go clockwise, which allows us to tackle the ledges earlier in the day while our legs are still fresh. A word to the wise: Don’t be fooled by the minimal elevation. Hedgehog delivers terrain similar to the region’s larger peaks. Because of this, pack not just for the trek, but also for the season. Still bring traction devices for potentially icy terrain, a windshirt for the exposed ledges, and a puffy coat for the summit, in addition to other essentials. Just because the leaves are almost all off the trees, that doesn’t mean it’s time to put the hiking boots away. Now is one of the best times for hiking in the Whites, so get out for a short trek before snowshoes become required gear. Already took one of these hikes from the Kank? Tell us about your trip in the comments. If you go to bed in the shirt you’ve been sweating in all day, it’s going to be hard to escape the damp chill. I often pack a spare base layer, so that I’ll have something dry to put on just before bed, and I’ll put all my dry layers—including puffy jackets, hats, and gloves—on over it. 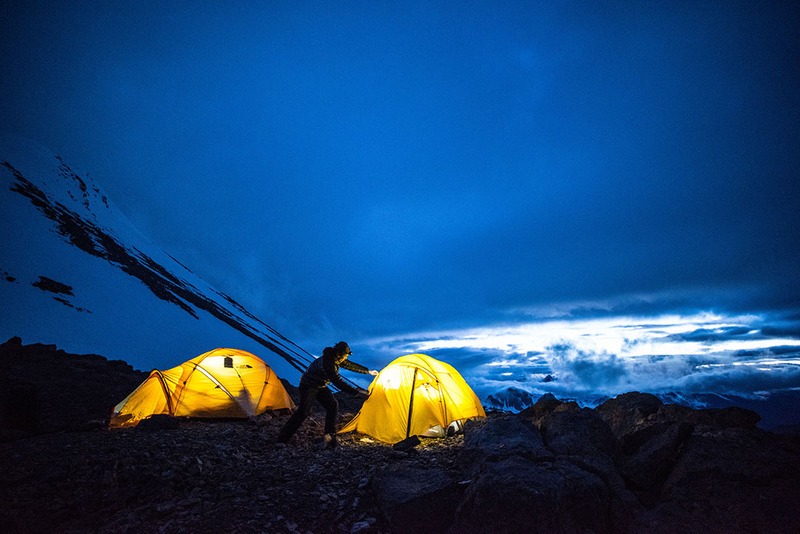 Finding a campsite away from the wind is another way to increase your chances of keeping warm through night. 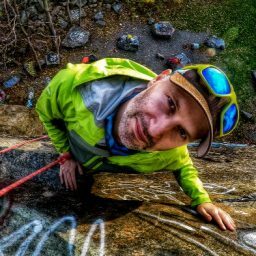 If you’re doing a multi-night Pemi Loop, for example, you’ll be much warmer if you walk the extra mileage down to the Mt. Guyot tent platforms instead of camping in overflow sites right on the Bondcliff Trail. If you’re unfamiliar, these are located on the ridgeline and get exposed to wind all night long. By contrast, the Guyot tent platforms are tucked away a few hundred yards below the ridge. There’s nothing worse than waking up in the morning and trying to force your feet into damp socks and ice-cold boots. 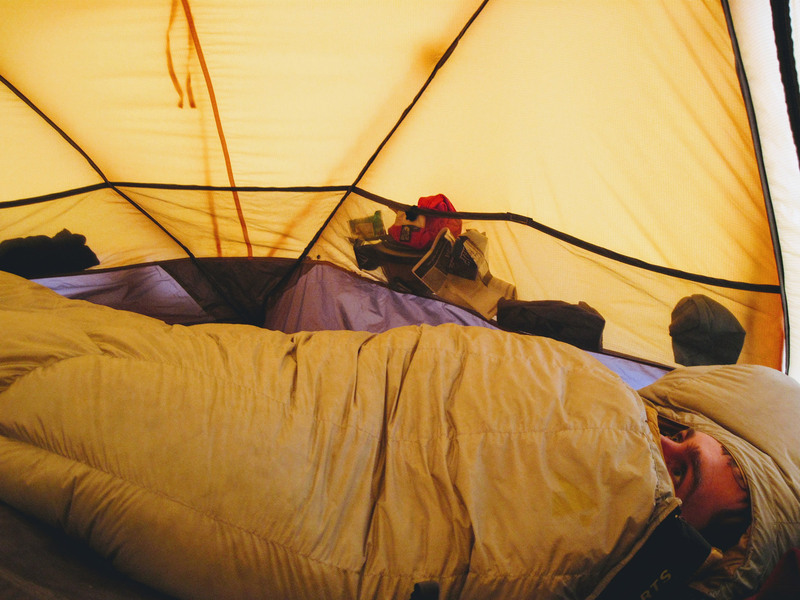 To prevent this, dry your socks in your sleeping bag overnight. And, if it’s really cold and your boots are soaking wet, consider putting them in a plastic bag—a grocery bag works well—and stuffing them into the bottom of your sleeping bag. They’ll stay warm enough, so that your feet won’t turn into icicles when you put them back on. It never ceases to amaze us that the person complaining about how cold the night was is also the same person who didn’t bother to zip his or her bag all the way up—or who wasn’t using the mummy hood. Pro tip: Wearing a hat to bed is a good insurance policy if you’re likely to squirm out of your mummy bag during the night. Although most focus on a sleeping pad’s comfort, it also serves an important insulating purpose by preventing conductive heat loss. I’ve found that the best combination for warmth and comfort is a closed-cell foam pad, like the Therm-A-Rest Z Lite Sol, on the bottom with an inflatable, like the Sea to Summit Ultralight, on top. Pro tip: Closed-cell foam pads also work great around camp, and are much warmer than sitting directly on the ground or on rocks. 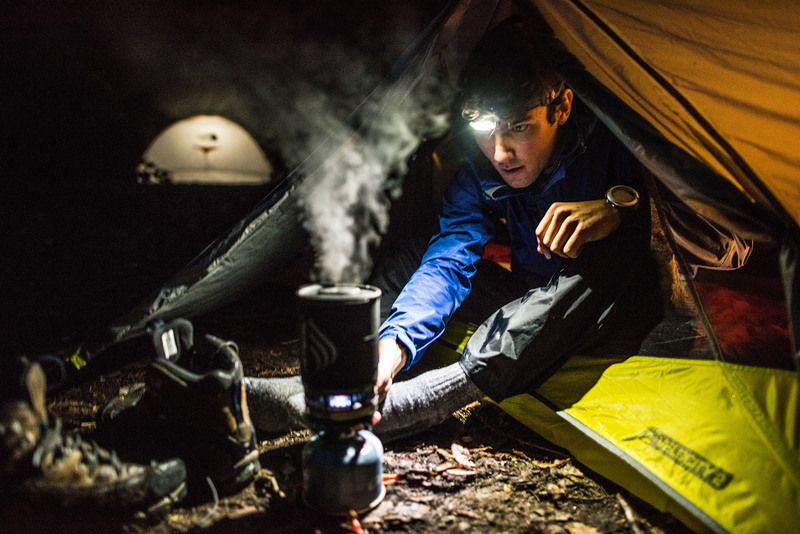 Fill your water bottles with boiling water before you go to bed, and then stuff them in your sleeping bag. They’ll act like a heating pad, keeping you warm all night long. Just make sure the caps are on tight! Get yourself some Yaktrax Handwarmers. Disposable hand warmers are an awesome addition to your fall backpacking kit. It’s amazing how much warmth these little suckers add when tucked into your pockets, at your feet, or simply stuffed into your sleeping bag. When it’s cold out, your body has to work extra hard to keep warm. To fuel your furnace, make sure to bust into that stash of cookies you hid in your partner’s pack. Hot liquids both increase your body’s temperature and work as fantastic morale boosters. If possible, avoid alcohol, which, in spite of the warm feeling it gives you, actually speeds up heat loss, and caffeinated beverages. The latter is known to dehydrate you—bad for circulation—and could send you on a cold run for the bathroom in the middle of the night. Good circulation is a sure way to beat the cold. If you’re hanging around camp, periodically get up to jog in place or do some jumping jacks—just try to avoid sweating—to increase blood flow and fight off the freezing temperatures. When the going gets tough, cuddle. If it’s colder than expected or you’re less prepared than you thought you were, there is always the miracle of body heat. You always wanted to get closer to your hiking partner…didn’t you? 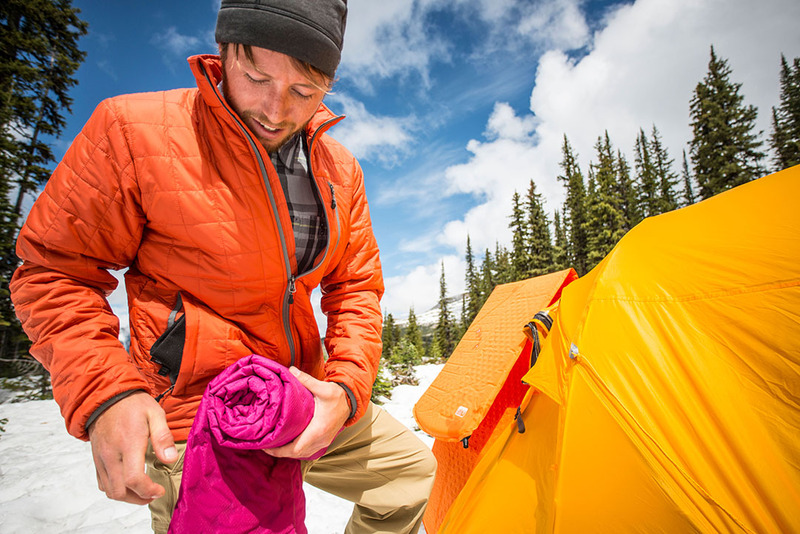 Do you have a tried-and-true trick for staying warm in the backcountry? If so, share it in the comments.